How to create a smart prop? Hi im just wondering how to create a smart prop for example I would like to put a door sign on the door knob so if I click the door sign(for door knob) it would automatically go to the door knob. Load the base item you wanted it to move with. This usually needs to be a rigged cr2 or dsf figure. Load the prop you want to be a smartprop. Parent the smartprop to the bone you want it to move with (not to the main item). Save just the smartprop to the library. Now when you load the base item first and then the smartprop, the smartprop should automatically move with the bone you chose. I first rigged it as a cr2 figure but nothing happens when I load them again and try to "fit" to my door bones what went wrong? it didnt even move. You will need to move the SMART PROP to the place you wish it to STAY before you Parent it to the item. Then it should SNAP to the same place when you load it. Example: If it is on the handle, place on the HANDLE before you Parent and Save. What do i save it as? Scene? Pose preset? File>save as >support assets> " figure prop assets" . if the item are parented to other node, "smart parent" option will be auto checked , in ds 4.5.1.
then load the prop. 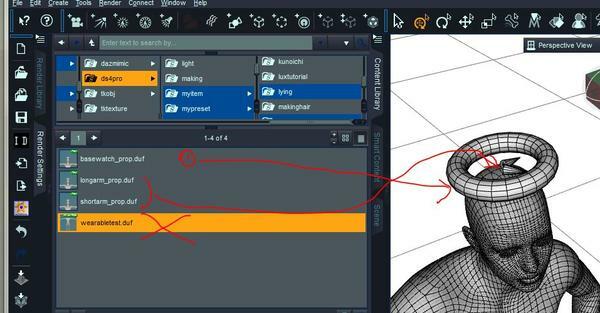 the prop auto translate the positon and be parented the node where you decide.. I have an addition to this smart prop question. It works, don't get me wrong I get it. What I do not get is how to get all items in the smart prop to save together. Made a watch with functional hour, minute, and second hands, along with a function date change dial. I made the watch body the Parent, and loaded the other four dynamic parts as separate objects and the parented them to the watch body. I positioned it, parented it to the forearm's bone. I then selected all of the items along with the watch body (the parent) selected last and saved as a prop/asset. When I load it, the watch body loads correctly, smart propped to the Genesis 2 figure. However, the other dynamic objects do not load with it. Clearly the watch body was saved because selected last. Why don't the rest save with it? Not only were they selected but they are also parented to the watch body. What am I doing wrong and how do I correct myself? There seems no way, to save smart prop with all child prop. 1 save the watch body as smart prop parented Actor, you seems have done it. 2 save each parts as smart prop one by one parented the body part. 3 when load them, you may need to load each item one by one with selecting each parent. load gen, poze him, select gen.
they can keep their hieralchy, and translation (scale too) as one watch. to keep each postion and hieralchy as one subsets. but you may need to adjust position when you load watch for your actor. It can not auto parent . I tested them with wealable preest, but it can not work about prop, as we expected. A wearables preset should also work, as long as each item has been saved as a prop asset first. I tested again now,, it work . To excuse me, I saved as figure and prop all three obj first. then save them as wealable preset. but I seems forget to select Actor when load wealable preset. then save them. of course it should not work,, then I believe, wearable preset could not work. Okay I am tracking here. I can get the watch and it's parts to load together as a wearable asset now. The one item of curiosity now is why we cannot check the parenting option, only the target pose? It is not a big deal to simply parent the watch to the forearm but the intention of the original poster is for smart propping so in the spirit of keeping on topic and expounding on a little more advanced smart propping...is a wearable capable of being smart propped? Not neccessarily. A multi-part prop could also be saved as a scene subset. The benefit is that one has to save his prop only once. I had a hard time to make a Poser gun prop , the Glock 17, DS compatible. It consists of four parts: the frame as main, and the slide, the trigger and the magazine parented to it. The real Glock has a polymer frame and a steel slide and I saw it neceessary to aply different reflection colors and strength and glossiness values to just look right. Unfortunately, all different surface groups bear only one material name, flagged as "Glock 17", so you can't make just one material preset for it if the different parts' surfaces need different parameters. After making different presets for all parts which turns into a nagging select-and-click-party everytime you load the prop I found out that a single scene subset preset does the job I wanted: storing all surface and posing values for a (almost) one-click load. But you always have to parent it manually to the figure. After reading about your wearables preset hint I gave it a try and made one for my Glock prop scene subset. Now I'm entirely satisfied, it loads with just a single click into the scene, automatically parented to the selected figure and all surface values applied. And with additionally tagging "Include Target Pose" when saving the preset I don't even have to separately apply the grasp pose for the Genesis 2 Figure anymore. A real luxury.